Security vendors have a mediocre track record in keeping their own applications and infrastructure safe. As a security product company, we need to make sure that we don’t get compromised. But we also need to plan for the horrible event that a customer console is compromised, at which point the goal is to quickly detect the breach. 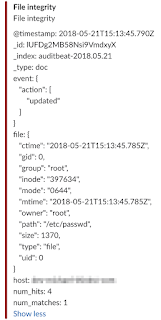 This post talks about how we use Linux's Audit System (LAS) along with ELK (Elasticsearch, Logstash, and Kibana) to help us achieve this goal. Every Canary customer has multiple Canaries on their network (physical, virtual, cloud) that reports in to their console which is hosted in AWS. Hundreds of consoles running the same stack affords us an ideal opportunity to perform fine grained compromise detection in our fleet. 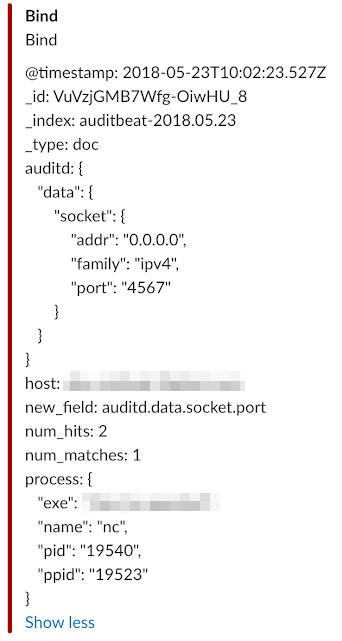 Going into the project, we surmised that a bunch of servers doing the same thing with similar configs should mean we can detect and alert on deviations with low noise. LAS has been a part of the Linux kernel since at least 2.6.12. The easiest way to describe it is as an interface through which all syscalls can be monitored. You provide the kernel with rules for the things you’re interested in, and it pushes back events every time something happens which matches your rules. The audit subsystem itself is baked into the kernel, but the userspace tools to work with it come in various flavours, most notably the official “auditd” tools, “go-audit” (from Slack) and Auditbeat (from Elasticsearch). Despite our love for Ryan/Slack, we went with Auditbeat mainly because it played so nicely with our existing Elasticsearch deployment. It meant we didn't need to bridge syslog or logfile to Elastic, but could read from the audit Netlink socket and send directly to Elastic. Our whole set-up is quite straightforward. In the diagram below, let's assume we run consoles in two AWS regions, US-East-1 and EU-West-2. Custom Python scriptlets to produce results that can't be expressed in search queries alone. ElastAlert runs every 10 seconds and generates our alerts (Slack/Email/SMS) to let us know something bad(™) happened. Let's see what happens when an attacker lands on one of the servers, and attempts to create a listener (because it’s 1999 and she is trying a bindshell). From here, either we expect the activity and dismiss it, or we can go to Kibana and check what activity took place. Filtering at the Elasticsearch/ElastAlert levels gives us several advantages. As Ryan pointed out), keeping as few rules / filters on the actual hosts, leaves a successful attacker in the dark in terms of what we are looking for. ElastAlert also gives us the possibility of using more complex rules, like “new term”. 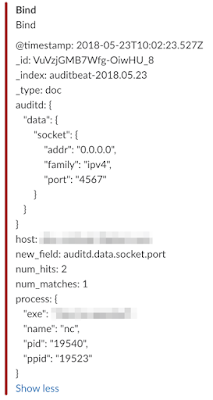 This allows us to trivially alert when a console makes a connection to a server we’ve never contacted before, or if a console executes a process which it normally wouldn’t. Running auditbeat on these consoles also gives us the opportunity to monitor file integrity. While standard audit rules allow you to watch reads, writes and attribute changes on specific files, Auditbeat also provides a file integrity module which makes this a little easier by allowing you to specify entire directories (recursively if you wish). This gives us timeous alerts the moment any sensitive files or directories are modified. Finally, for alerts which require computation that can't be expressed in search queries alone we use Python scripts. 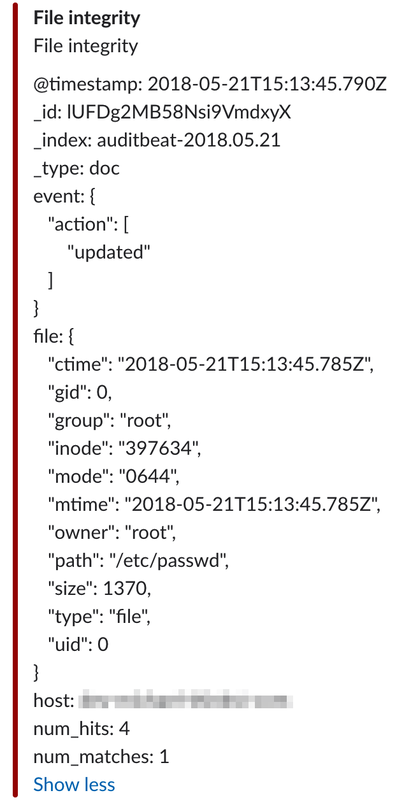 For example, we implemented a script which queries the Elasticsearch API to obtain a list of hosts which have sent data in the last n-minutes. By maintaining state between runs, we can tell which consoles have stopped sending audit data (either because the console experienced an interruption or because Auditbeat was stopped by an attacker.) Elasticsearch provides a really simple REST API as well as some powerful aggregation features which makes working with the data super simple. Our setup was fairly painless to get up and running, and we centrally manage and configure all the components via SaltStack. This also means that rules and configuration live in our regular configuration repo and and that administration overhead is low. ELK is a bit of a beast and the flow from hundreds of Auditbeat instances means that one can easily get lost in endless months of tweaking and optimizing. Indeed, if diskspace is a problem, you might have to start this tweaking sooner rather than later, but we optimized instead for “shipping”. After a brief period to tweak the filters for obvious false positives, we pushed into production and our technical team pick up the audit/Slack alerts as part of our regular monitoring. It’s a straightforward setup, and it does what it says on the tin (just like Canary!). Combined with our other defenses, the Linux Audit System helps us sleep a little more soundly at night. I'm happy to say that so far we've never had an interrupted night's sleep! Hi, This is a very fantastic and very great post. Thank you for giving the unique details about this topic and Keep it up!! !